potential customers can always find you. Atwill Media works with you to build the missing tool in your marketing kit. Your website is built with all the pieces that you need to run a cleaning business. 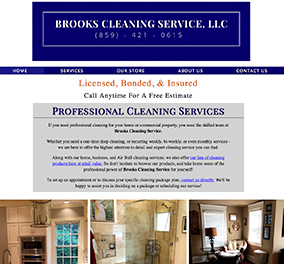 Each page is fully customized to showcase your skills and the different cleaning services that you provide. No need to overthink it! Let the Atwill Media team give you all that is necessary to successfully compete with other businesses in your industry. Yes, I want a cleaning website! Powerful features customized to fit YOUR needs. We understand that not every cleaning business in the industry is identical. The values, beliefs and mission can vary depending on the owners and staff. This is why Atwill Media websites are created with a variety of features that are customized to meet YOUR needs. We've got the supplies you need to strengthen your marketing strategy! We know trust is key in the cleaning industry, and a detailed About Us page will let the customer get to know you while gaining their trust and confidence. Showcases your knowledge of all things cleaning. Gives customers insight into why your cleaning services are important and valuable. Take advantage of your existing customer relationships and showcase testimonials to help improve your trustworthiness with potential customers. Clearly and efficiently outlines the cleaning services you offer, removing questions customers may have about your work. 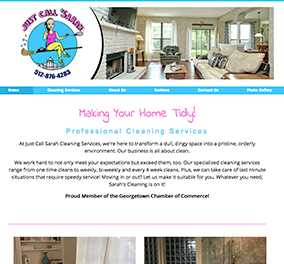 Helps with SEO by ensuring customers find your business when looking for specific cleaning services. We understand that employee turnover can be high. This form can help to increase your business's reach for finding and receiving applications for qualified cleaning service employees. Showcases your knowledge of the cleaning industry. Answers questions quickly and naturally aids SEO efforts. 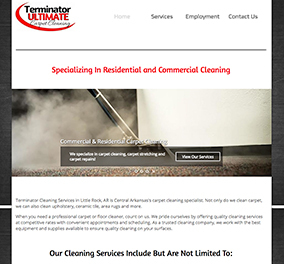 Ensures the website shows up in the correct service areas when customers search online for cleaning services. Let customers conveniently pay online for your cleaning services. Upload to your website! Showcase before and after photos of cleaning jobs you've done to provide customers with a good visual of what your cleaning services can do. Customers can call with one click from your Atwill Media website to contact you for cleaning services. Not all cleaning jobs are priced the same, they all vary from job-to-job. With this form, customers can request a pricing quote for a cleaning service for their home or business. This form allows your customers to request cleaning services online, providing you with the information needed to do the job without needing to place a phone call or schedule an appointment. Have a limited-time offer or a special deal you're sure will bring in business? Advertise specials, promotions, sales, etc. on your website. If your business has a subscription program for regular customers that want weekly or monthly service, they can sign up for regularly-scheduled cleaning services via this form. We give you all the cleaning supplies needed to sweep the competition. Trust is everything when it comes to creating and expanding your business. By utilizing our squeaky-clean features, we are able to help you build that trust with your current and potential customers. Atwill Media knows how competitive the industry is, but also understands how each cleaning business is different. Some service commercial clients, others only service residential properties, while others do both. That's why through much research, we've found the best way to design websites that are tailored to YOU specifically. Our mission is to help you build a spotless reputation by dusting the dirt off your current marketing efforts.